Bridgeton real estate is mostly made up of established and older homes between 40-90 years old with an average age of 56. These single family homes offer floor plans with 2 bedroom, 3 bedroom or 4 bedroom options. Bridgeton MO homes for sale range in price from approximately $50,000 to approximately $135,000. The median home price in 2014 was about $93,000. Residents of Bridgeton MO real estate are located within minutes to Lambert-St. Louis International Airport. Bridgeton MO is known for its vibrant retail corridor on St. Charles Rock Road with businesses such as Walmart Supercenter, Target, Kohl’s, Best Buy, Home Depot, Lowes, Sports Authority and a number of quick service and casual dining restaurants. The “Rock Road” is a regional shopping destination. Bridgeton residents enjoy eight city-owned parks including the Berry Hill Golf Course, the Bridgeton Municipal Athletic Complex and the Bridgeton Crossing Family Aquatic Park among the 256 acres set aside for picnicking, sports, swimming, trailblazing and leisure activities. If you’re interested in learning more about Bridgeton MO homes for sale or would like information on how to sell a home in Bridgeton MO, please contact St Louis County real estate expert, Sharon Colona and St. Louis Realty for a professional and simple buying or selling process. Call (636) 397-7653 or email at scolona@stlouisrealty.net. COMING SOON First Showings Open House Sunday April 28th 1:00pm - 3:00pm. The curb appeal will draw you right in to this 2 story home in Meyer's Acres! The main level offers the open floor plan you've been searching for with spacious family room, eat-in kitchen featuring center island, plenty of counter space & walk-in pantry plus separate dining room. Guest bath and laundry complete the first floor. The open staircase leads to your dreamy master bedroom suite with dual basin vanity, soaking tub, separate shower and walk in closet! Three comfortable bedrooms and hall bath complete the second level. The walk-out lower level features flexible finished space for additional family or play room, sleeping area or home office + full bath. Enjoy BBQ's and entertaining on the large deck just off the kitchen. Award winning Pattonville schools and convenient to shopping, highway access & airport. Seller is offering flooring credit for new carpet. OPEN HOUSE SATURDAY APRIL 20 FROM 1-3PM! Darling curb appeal, quiet backyard, roomy 2 car garage and that x2019;s just the beginning. 3 BEDS, 2 BATHS and 1908SF on main floor means well-proportioned rooms for easy living! This refreshing floor plan has everything a buyer could ever ask for! Hardwood floors, updated kitchen and bathrooms, and crown molding in every room. Separate living and dining rooms and a nice big great room that opens to the kitchen, which works great for both entertaining and family living. The home rests on a large lot with a private, fenced yard. The basement has been studded out and it has rough-in for bath. Finishing what has been started for you in this basement would double the livable square footage! Main floor laundry and utility room. Convenient access to highways, desirable Pattonville schools, shopping and the airport too! Quality living has remained a priority for these sellers. Not only is it overflowing with value, it x2019;s x2026; Affordable, Livable, Lovable! NO WAY! Almost an acre with 3 FULL baths and MOVE IN READY! This home was FULLY RENOVATED in 2018! Gorgeous hard wood floors, ceramic tile, granite counter tops, fresh paint and brand new top of the line bathrooms and YES there are 3 FULL BATHS, a massive partially fenced in yard (0.75acres) an OVERSIZED HUGE fully insulated two car garage, enough space for TWO large vehicles and a LARGE work space! BRAND NEW electric, plumbing, water lines, septic tank w/ warranty, panel boxes, water heater, sump pump and newer furnace, new roof, siding, and driveway. Beautiful new kitchen with custom slow close cabinets and drawers, attached to great room with lots of natural light. Bonus living room area next to bedrooms. Freshly seeded yard, New engineered roof trusses, 16-inch overhang, new sheeting, and new architectural shingles, New vinyl siding, vented soffit, and ridge vent on covered porch (6 feet deep) and efficient double pane windows. This house is a MUST SEE for any type of buyer! This home is move-in ready. Spacious rooms, 4 car garage (or workshop) and convenient location make this a great find. The main floor has a master bedroom, large living room with cove ceilings, and large kitchen/dining room with updated flooring and an updated full bathroom. The lower level already has drywall and would be an easy finish. Don't miss the outside - the textured vinyl siding, updated windows make it low maintenance, and the covered deck is great to enjoy year round. There is also a large detached garage, could be a 4 car garage or workshop (it does have it's own electric). 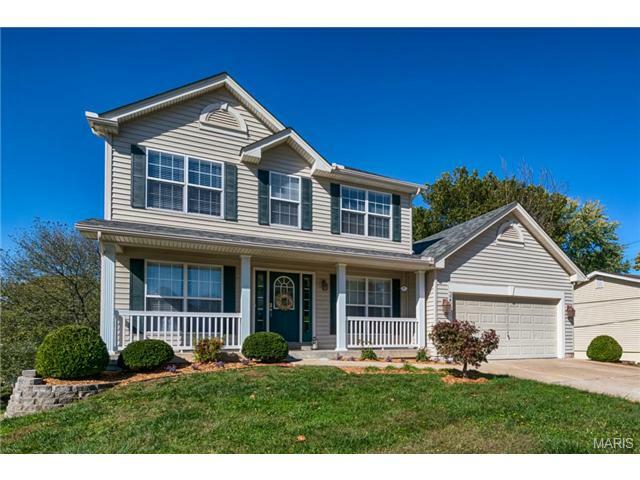 **OPEN SAT, 4/20 1-4PM** Located in the Pattonville School District! This 3 bedroom 2 full bath brick home has some tile and wood flooring. The master bedroom has a walkout to the deck overlooking a beautiful backyard. The basement is finished with a walkout patio and sump pump. Open floor plan with living room dining room combo. Over sized two car garage and the owner has lived there since it was built in 1971! The house has new windows and a shed in the back! GORGEOUS! 2 Bed, Full Bath, MAIN FLOOR PRIVATE LAUNDRY! NEW-2019! - REFINISHED HARDWOOD & CERAMIC TILE FLOORS! RECESSED LIGHTING, CEILING FANS! New Shower & Tub Walls! CUSTOM CABINETS with Wine Bottle Cab & GLASS DOORS! STAINLESS REFRIGERATOR! DISHWASHER! SMOOTH COOKTOP/RANGE/OVEN! GRANITE COUNTERTOPS! Fresh Bright Trendy PAINT Colors, Door & Cabinet Hardware!! Vanity, Light Fixtures, Faucets, This List Goes ON & ON! Almost Everything is UPDATED in this Unit!! IMMACULATE!! IT WILL NOT LAST LONG! Beautiful Park Like Setting, Lovely Walking Areas/Private Lake. All Elec unit/low utility costs. Sr. Community, 1 owner must be 52 yrs min. Close to Shopping, Schools, Major Thoroughfares, 15 mins Dwntwn & Airport, Check into Brdgtn City Amenities, Events, & Programs, Day trips poss. Senior Transportation Van Program. Lots of Storage! LEVEL ENTRANCE into unit/NO STAIRS from living rm entrance. Concrete Patio, Perfect for Barbecuing w/ Family & Friends! NO RENTALS. 3 different Assocs in subd. © 2019 St. Louis Realty. All Rights Reserved. Sitemap. Real Estate Website Design powered by Home Junction.